In Victorian times portraits of the rich and famous included many personalities who were artists, politicians, literary figures and scientists. This reflected a much wider interest in such individuals than was evident in the18th century. Before 1800, a typical portrait would be of a wealthy landowner, merchant or a nobleman and their families. Increasingly, after that date, portraits of all kinds of people were commissioned. The invention of photography finally ensured that even people of modest means could have their portraits made. Frith painted this portrait at the height of the novelist's fame in 1859. Dickens is seated in his study in his house in Bloomsbury, and some of the first chapter of ' A Tale of Two Cities' (published 1859) is shown on the desk in front of him. The picture delighted John Forster, Dickens's friend and biographer, who had commissioned the work, but Dickens himself was less enthusiastic about the way his expression had been rendered. 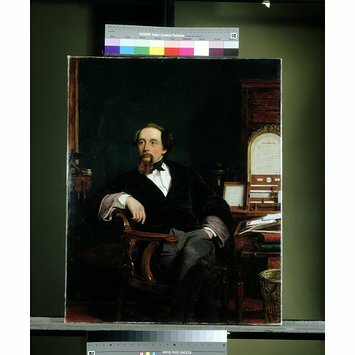 Forster had arranged for a photograph of Dickens to be taken before the painting was started, but it was not a success, and the artist Frith did not use it to help him paint the portrait. 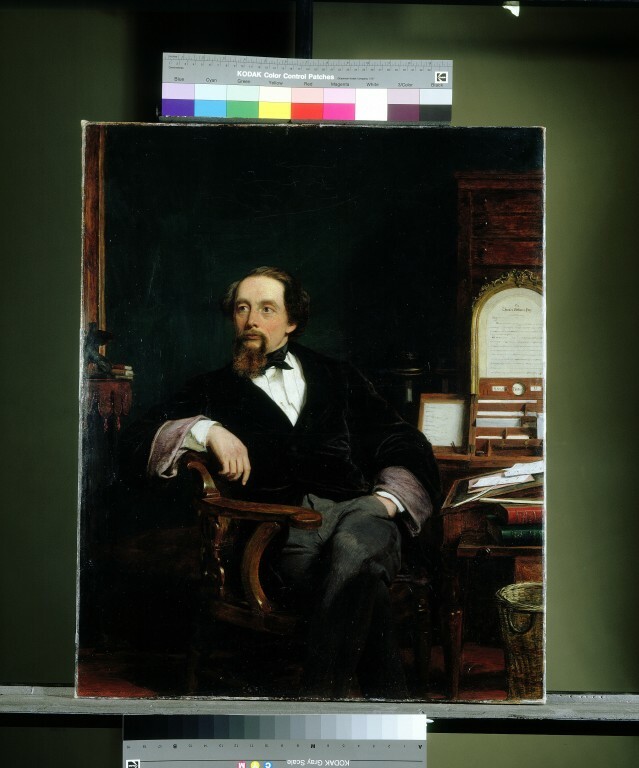 Dickens, wearing a black overcoat, sits writing 'A Tale of Two Cities'. 'David Copperfield' and another bound volume lie nearby. Behind him a calendar and an address from the City of Birmingham are displayed. Bequeathed by John Forster, 1876. Bills, Mark and Vivien Knight, eds. William Powell Frith. Painting the Victorian Age. Yale University Press; Guildhall Art Gallery, 2006. ISBN 0300121903.